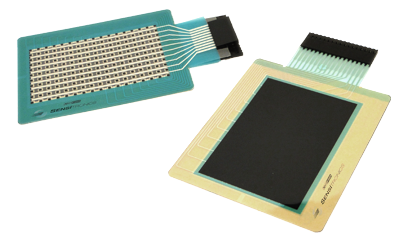 Sensitronics' MatrixArray products are comprised of a multitude of force sensing resistor elements arranged in a grid. Providing n-input multitouch + force sensing capabilities, MatrixArrays are the basis for musical instruments, PC input devices, and other innovative designs. To help you get started, here's a basic example demonstrating how to connect and read one of our 16x10 MatrixArrays, using an Arduino and some commonly available parts. To get this demo up and running, you'll need the parts listed below. We'll assume you have some basic Arduino coding experience, but actually, we've included complete code examples - As long as you know how to upload an Arduino sketch and open a serial terminal window, you can copy and paste all the way to a working demo, if you'd like. Could this be done with less hardware? 1. It keeps the design and code clean. This project is an example, so we wanted to maximize clarity. 2. It's highly scalable! Following the same pattern of connection, and changing just 2 lines of code, this example could be expanded to scan a 96 x 96 (9216 cell) matrix. ©Sensitronics, LLC. All right reserved 2019. All images & intellectual property protected under copyright laws.